The 13th annual Ashraf Lodewyk Memorial Basketball Tournament ended in both Wits men’s and women’s teams losing in the finals. 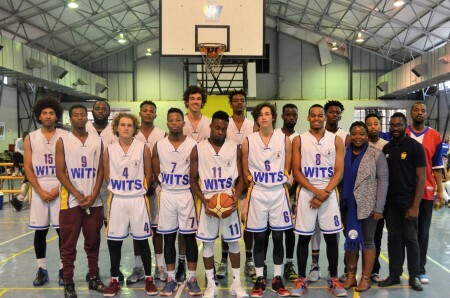 The Wits Horny Bucks and the Wits Lady bucks both lost in the finals of this year’s 13th annual Ashraf Lodewyk Memorial Basketball Tournament which was held at Hall 29 on West Campus from Friday April 25 to Monday May 1. The Lady Bucks lost 56 – 52 to the Phoenix Flames from Port Elizabeth, while the Horny Bucks were beaten 74 – 54 by the Jozi Nuggets. There were 37 teams in the seven-day tournament, 24 of them men’s and 13 female. In total, 106 matches were played. The Lady Bucks lost a closely contested game, however, the contribution of two of their players, Ipeleng Nyatlo and Fortunate Bosega, was recognised as they were selected to the ladies All Star team. Bosega was also named the Most Valuable Player of the tournament in the women’s category. Even though the Wits men’s team were convincingly beaten in the final, two of their star players, Everisto Pasipamire and Angelo Quinn, were also named in the men’s All Star team. This annual tournament is in commemoration of the late Ashraf Lodewyk, a first team player and an active member of the Wits Basketball Club when he died in a car accident 13 years ago. Chief organiser, Manyani Maseko, said what was unusual about this year’s tournament was that there was a Wits alumni ladies team and three junior teams made up of high school students. This was one of the highlights of the tournament according to Andrew Gonese, the Horny Bucks captain, who said he was impressed by “the way in which high school teams were able to compete and challenge the senior teams”. Gonese also said that although he did not know much about Ashraf Lodewyk, the man the tournament is named after, he thought it was by far the best and most competitive basketball competition in the Wits Basketball calendar.